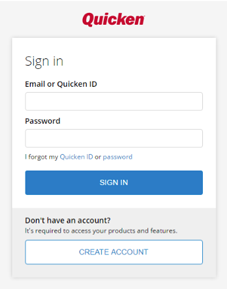 Set-up is easy, and the user-friendly functionality of Quicken will help you take control of your finances faster and more efficiently. 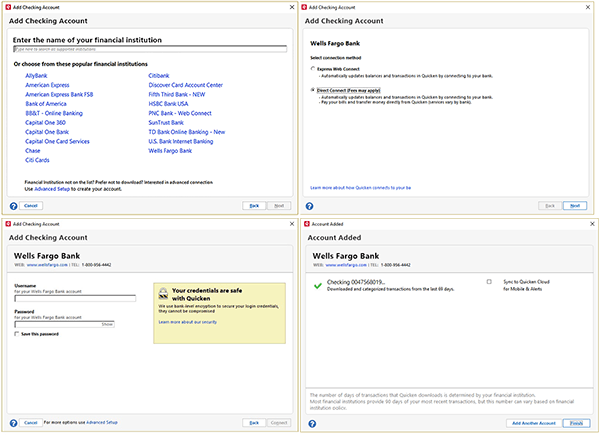 Add your Wells Fargo business accounts to Quicken for a financial overview and easier money management. Compare features to determine your business needs. Business accounts reconcile automatically with supported software. You’ll save time and take care of the books more efficiently. Elect to set up Business Bill Pay on Quicken, and take care of payables and bills in one convenient place. Additional fees may apply. Just add your Wells Fargo Business Online® accounts to your Quicken software, and connect. 1. Open your Quicken software. 2. Select Wells Fargo Bank as your Financial Institution. 3. Type in your Wells Fargo Business Online username and password. 1. In the first pop-up menu, select the account type and click Next. 2. On the next screen, choose Wells Fargo Bank and click Next. 3. 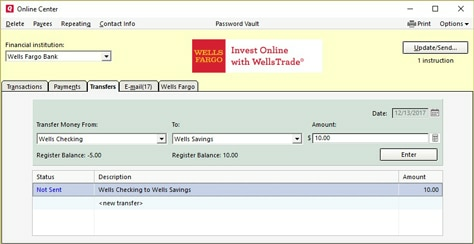 To transfer funds, pay bills, or send and receive email from Wells Fargo, select Direct Connect from Connection Method, then click Next. 4. 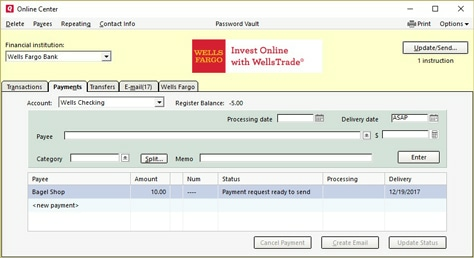 Type in your Wells Fargo Business Online username and password. Click Connect. 5. 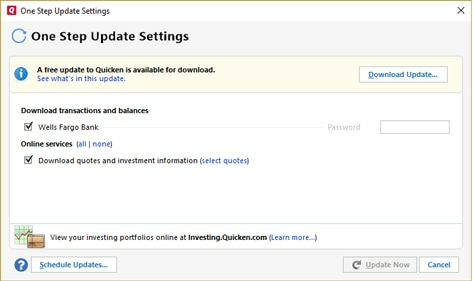 Verify your list of all accounts enabled for Quicken access. Select Finish. 1. Click the Update button, then One Step Update Settings. 2. Choose items to download from Wells Fargo. 3. Enter your Wells Fargo Business Online password. 4. Select Update Now to download transactions. 1. Select Reconcile from the Account Actions drop-down menu. 2. 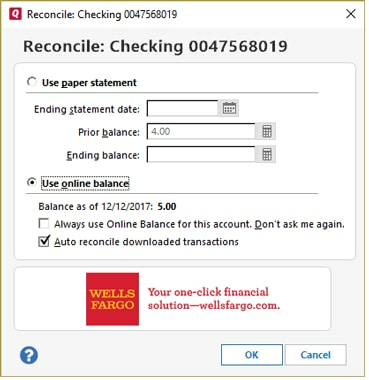 In the Reconcile Online Account dialog box, select Paper Statement or Online Balance. 3. If using Paper Statement, enter statement information, then click OK.
4. If using Online Balance, you can choose Auto Reconcile, then click OK.
5. In the Reconcile dialog screen: Select Mark All, then click Finished. 1. Select Transfers and choose the account from which you will transfer money, the account to transfer to, the amount to transfer, then Enter. 2. To send transfer request to Wells Fargo, click Update/Send. Go to the Online Center found under the Online drop-down menu. 1. Click the Payments tab, and choose a payee from the drop-down menu and a dollar amount. 2. If the payee is not on the list, then click the Payees tab and add the payee. 3. Enter date to pay and amount, then click Update/Send. The One Step Update dialog box will open. 4. Check the boxes of the payments, transfers, or download transaction requests to send to Wells Fargo. 5. Enter your Wells Fargo Business Online password. 6. Click Update Now to send payment.